A commercial for a popular cereal bar spurred my thoughts towards breakfast, the most important meal of the day, and why it is so named. No offense to this popular and convenient option, but my initial response was irritation because the ad implies that said bar will improve one’s eating choices for the rest of the day. That’s quite a lot of pressure on such a small bar. Despite my critique, the commercial raises a valid point: Breakfast sets the tone for the day. The cereal bar in and of itself is not going to force you to make different choices as you move through your day, but a solid foundation of protein, carbohydrate and fat just might do the trick. A bar on its own does not make much of a breakfast, but it beats skipping the meal, and is a good starting place for those in the “but I’m not hungry in the morning” camp. Start the momentum early. Our first choices influence the rest of the day in powerful ways. The more physically satisfied we feel following breakfast, the more likely our needs have been met, so we enter into lunch with a clear head. A clear head makes for improved choices (less fat, leaner protein, more whole grains, more fluids, smaller portions, more veggies, etc. depending on your goals). For those new to the breakfast routine, let’s summarize some research on the importance of the fast breaking morning meal. Much breakfast-related research focuses on children and adolescents, and relates to academic performance. Even so, the benefits are clear, and adults could use some gentle reminding from time to time. 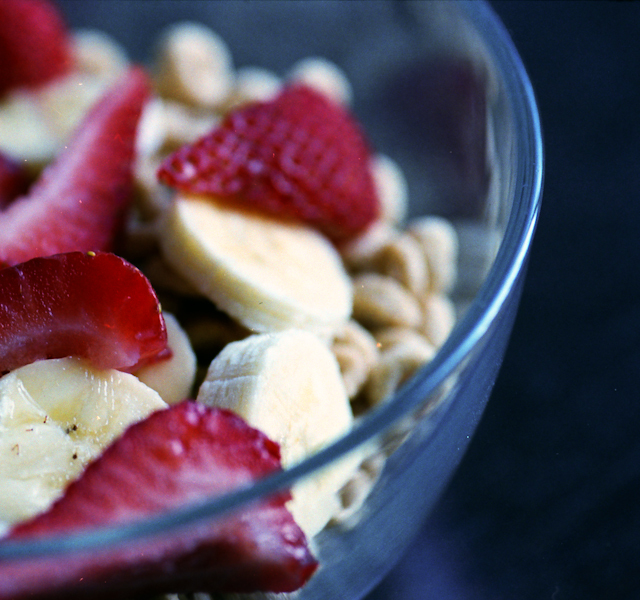 A breakfast meal can improve memory, concentration, and play a role in weight management. For students, a solid breakfast has been correlated with fewer absences and better school behavior. And in terms of long-term impact, children who eat breakfast are less likely to be overweight and may make healthier choices as they grow. Consider a day when breakfast was skipped, and compare that with a day you enjoyed more balanced choices. Think about your focus and energy. What were your food choices like for the remainder of the day? Getting that morning kick-start has benefits that last, and it’s worthwhile to establish a consistent breakfast routine. If you fall in the “but I’m not hungry” or “my stomach feels weird in the morning” category, then creating a routine with a balanced breakfast can be a legitimate challenge. Start small and build from there. Use trial and error to find items that work with a sensitive stomach. Tune into your body’s physical cues and ask yourself questions about hunger, and what it feels like for you. Everyone is different. Your stomach may not be growling, but your body may be sending other signals (headache, irritability) to let you know fuel is required. If your breakfast routine is going strong, then keep up the good work. Try working in some more variety to avoid getting in a food rut. Most people tend to find what works and stick to it; it’s human nature. We’re more likely to meet our nutrient needs with increased variety, plus it’s fun to explore new options. – breakfast casseroles – with veggies! – egg burritos – cheese, beans, veggies, salsa, etc. Look for high fiber, whole grains, lean protein, low fat or fat free dairy, and fruit as main meal components. Bottom line: Get going with a solid morning meal and reap the results throughout the day. Start with small goals, be creative, and enjoy the most important meal of the day! What gets you started in the morning? Are you a former breakfast skipper with advice to share? Let us know what works for you!